Augustine (Romilly n°7) is mainly sailing around the “Pertuis Charentais” where the natives are mostly sea farmers: they raise oysters in very shallow waters. Its an area of sands, marshes, nasty currents and minuscule harbours nested in the middle of the land. It was precisely the occasion to test the new boom setting I designed during the winter, and the boom vang imagined to control the boom in downwind situations. When going upwind, to give the sail the best possible shape, it’s important that no part of the main be in front of the mast. So I put the downhaul right under the sail tack. Thus we’ve got the same configuration with the boom than without. When sailing downwind it’s quite the opposite. It’s better to prevent the boom from raising and become out of control. Thus I imagined to release the downhaul, and with the use of the boomvang, keep the boom horizontal and make it slide windward. It worked beautifully, so despite a very modest start we progressively caught up and finally ended first. To go further, two things must be said. First, seeing these pictures, I realised with a sort of shame, that the “leg’o‘mutton” of the mizzen was absurdly too tight, giving a very bad look to the sail and surely at the cost of some efficiency. 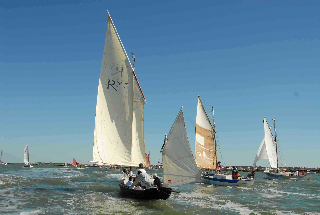 Second: toward the end of the race, we changed tack. The other was far better. Moreover with the boom vang arrangement its possible to stay on the port (good) tack, even with the wind coming slightly from the “wrong” side. It’s even possible to release the sheet some more, using the sail like a square one, and adjust it to receive the wind (slightly # 10°) from starboard, even on the port tack. Whatever, this is another reason in favour of the lug rigging: its versatility. You can do a lot of thing with it, and adapt it to a lot of situations. The counterpart could be some difficulties to keep it under control. For example, sailing single handed, I’m not always comfortable to lower the sail with 20 knots of wind. You sure know what I mean: the gaff do whatever figure it wants to do, the wind catch the sail half lowered, the boat decides not to face the wind any more… Did anybody find something useful in these situations? 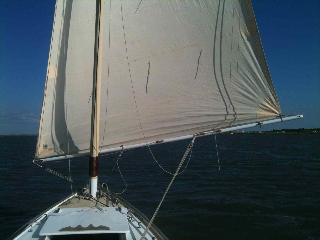 To lower the sail more rapid in strong winds I simply made a line on the halyard that went diagonally to the boom’s end. Standing in the cockpit I can lower the sail in 1-2 seconds by pulling this line, even in strong winds. The only problem I still have is that large part of the sail at the mast-front. Even a lazy jack line there still leaves me with a part of the mainsail – sometimes -caught by the wind. I have to go forward then to bind that part of the sail on the boom. Thank you for your comment. If I understand you well enough (excuse my poor English) you seize a line on the gaff at the point where the hallyard itself is seized? I seized a line on the halyard-boom where the halyard goes round the mast with the parrels. 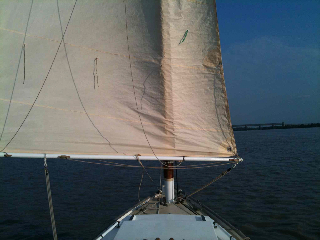 This line went diagonally down along the mainsail to the aft-end of the (lower)boom. Standing in the cockpit I pull the line and the sail is “in a jiffy” down. 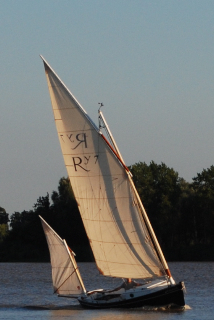 I had problems with lowering the mainsail, especially in strong winds. The sail did not want to go down and was – half way – often caught by the wind. So I used some tricks to force the mainsail down and it worked. Mind you, I sail with a boom and made some lazy jacks to catch the sail. I also changed blocks on the halyard (lewmars) and this helped also. Anyway, anyhow, Romilly’s mainsail is high peaked and has a lot of square meters and that’s actually the real cause of the problem. But I can live with it. Thanks a lot! I’ll do that this winter. I cant wait to try.